A group of 245 USD students from about 56 different countries are experiencing college life in a whole new world. Many of the international students on campus have to deal with a new language, a new country and a new culture, all while trying to adjust to life at college. With the struggles of international students in mind, USD’s International Services, and programs like CAGE (Center for Academic and Global Engagement), are working to make the international students’ adjustments a little easier. Patrick Morrison, assistant director for International Services, said they have many programs and services to ease the transition for international students. International Services helps incoming students with their visas, they give them rides to and from the airport, and gives them welcome baskets with things like blankets, sheets and toiletries. International students may need assistance with everyday errands, like running to the grocery store, as well. To help with this, International Services drives international students to Walmart every other week, and once a month they take trips to either Sioux Falls, Sioux City or Omaha. They even have a cultural weekend trip once a semester — this semester’s trip will be to the Black Hills. 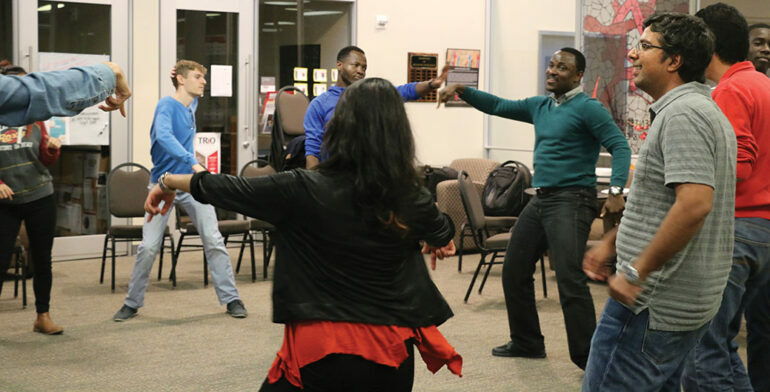 “These services are open to all of the international students, but they don’t have to use them, maybe 15-20 students use them at a time, but it’s not always the same students,” Morrison said. The most useful service they offer, Morrison said, is compliance advising. This is designed to advise them in maintaining their regulations of their visas. Adjusting to the new lifestyle is difficult for some students because of the starkness of the change. “It’s all different all at once,” Morrison said, “there isn’t a single biggest challenge, though, it’s different for every student.” However, Morrison also said most of the students adjust very well. Looking to the future, Morrison hopes to see the campus work toward making campus more international-friendly. Rajbhandari said the Writing Center is vital because they can to help the international students. This is crucial for international students because, for many, English isn’t their first language. Rajbhandari also started the iCycle initiative in partnership with local bicycle co-op Recycle 605. iCycle is a program where international students can buy refurbished bicycles for as little as $20. This eases the transportation difficulties of international students, since many do not have cars. Morrison said that the university does a good job with student services, and he added that it’s important that international students enjoy their time at USD. Rajbhandari said she appreciates the help that international students receive at USD. Correction at 2:46 p.m. on 9/22/16: Prakriti Rajbhandari is from Nepal. A previous version of this article said she was from Nepal, India. Nepal and India are two separate countries.